Cryptocurrencies were formed on the basis of good faith, however when the essence of the technology relies on something being hidden it will always be abused and attract abusers. When the level of abuse (read scams) becomes too high the cryptocurrency price crashes and innocent people are defrauded out of their money. 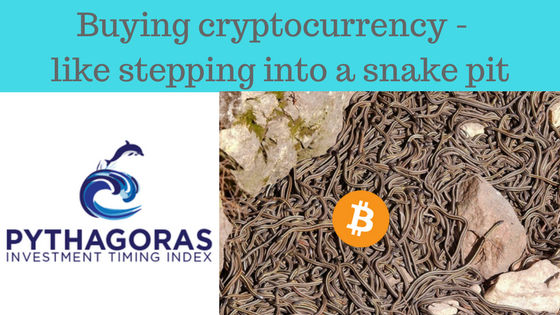 Buying cryptocurrency is akin to jumping into a snake pit – it is inevitable you will get bitten – its just how quickly it will happen. We previously warned of this when the cryptocurrencies were surging in value. Optimists were lured into the snake pit – and you have seen the result – massive losses. In summary, there are 3 key issues which are very important – corruption, regulation and innovation. Corruption. This cryptocurrency market is full of corrupt operators. Upside comes as more shady characters are attracted to deal further in cryptocurrencies. Given the anonymity, they can easily lurk and prey on unsuspecting individuals. We expect this criminal activity will rise as the opportunity for abuse becomes more widespread. Regulation. There is no regulation. Manipulation will continue to occur in the absence of regulation. We expect governments will attempt to impose regulation to curb this. This must reduce demand for crypto-money. Innovation. We see more technology being created in the cryptocurrency space – and with this, a higher risk of people being ripped off. The link to that paper is here. This story will self-repeat – there will be winners and a whole lot more losers. When something doesn’t have full transparency or the protection of the law, you are going to lose money. “We want people to continue to discover and learn about new products and services through Facebook ads without fear of scams or deception,” Facebook said. Every generation has one big event which is sent to relieve them of their hard earned cash – it appears the current generation’s is cryptocurrency! Why take on the risk? We do things mathematically. Pythagoras analyses changes in our proprietary volatility timing index and predicts share price behaviour. Clients choose the stocks that interest them and Pythagoras provides the recommendations. The recommendations are simple to use, even for the new investor. A buy has a timing and a price range. A sell has a timing. They are emailed and messaged (SMS), ensuring that our clients are always informed of important stock notifications. All the complex work is done behind the scenes. There is no need to take extreme risks like cryptocurrency. With this mathematical precision at your fingertips, you will have the knowledge to make your hard earned money work even harder! World stock exchanges have stood the test of time and are universally regarded as the appropriate method to invest in stocks. To some people, using Pythagoras to invest in the stock market is seen as revolutionary therefore too high risk. The surging trend of cryptocurrency punting shows that there is a real desire by people to make stronger returns with less work. Pythagoras is the perfect blend between the two – invest with the safety of the stock market, achieve higher returns and relax, knowing that you don’t have to do anything other than transact the recommendations. All the hard work is done for you.